Welcome to your latest Friday-based Juneau-centric round up of political rumor and gossip. Have a nice weekend and enjoy skits! If only you guys didn’t schedule it on the same weekend as All of the Wrestling Weekend, I would have tried my best to make an appearance. If it weren’t for everything else this week, we’d say congratulations are in order to Gov. Michael J. Dunleavy, who later today will accomplish something Sen. Mike Dunleavy never did during his five years in the Senate Majority: See a bill authored in his name be signed into law. Of course, he’ll also be doing the signing. The governor is set to sign Senate Bill 38, the earthquake and disaster relief bill by the Senate Rules Committee by request of the governor, today at 1 p.m. at the State Emergency Operations Center. The bill makes about $133 million available for earthquake relief benefits ($67.9 million), road repairs ($73.5 million), unemployment benefits ($1 million) and supplemental firefighting funding ($7.9 million). It spends $30.4 million of state money with the remainder coming from the feds. Hopefully, he’ll save Sen. Mike Dunleavy a pen. Speaking about federal matching funds, it was uncovered by Alaska Public Media this week that Gov. Michael J. Dunleavy is keen on the conservative dream of converting Alaska’s Medicaid program into a capped block grant program. It comes from a line in a longer letter to President Donald Trump, where the governor essentially saidthat the state’s eager to become the country’s first state to put a hard cap on Medicaid spending. This was an idea last proposed when Republicans were intent on repealing the Affordable Care Act in 2017, and it was widely considered to be a bad idea by people who cared about health coverage for poor people. The gist of its impact would be fewer benefits covered for people on Medicaid, fewer people covered or a combination of the two. It falls somewhere under the idea of… empowering… states… to… hmm… make… the politically unpopular cuts themselves? While judging the impact Alaska would feel under the program is difficult without knowing more than a few sentences in a letter, prior proposals that would have transformed the program into a per-capita spend painted a pretty dire picture of Alaska because, as you might have heard, Alaska has pretty high health care costs. With timing that is surely just a coincidence, it was announced that as of Thursday morning that Division of Health Care Services Director Margaret Brodie is no longer in the position. The division happens to oversee Medicaid services among other benefits, and it’s probably also just a coincidence that the administration has essentially refused to say whether she’s resigned or been fired. Well, one tipster tells us that she was eliminated via a call from the governor’s office that they had, in fact, accepted her resignation. You know, the resignation that most at-will employees had to give when the new administration came on with all those loyalty-or-you’re-fired letters. The ones that the administration is currently still facing a lawsuit for? The tipster also says that it all comes after Brodie was told by Commissioner Adam Crum that she was going to be kept on. No word on why they needed to wait five months to make the call. Another source told us that Brodie was also escorted out of the Department of Health and Social Services Building. This also comes as Quinlan Steiner, the long-time head of Alaska’s Public Defender Agency, announced he will resign. Speaking of job security, we still find it really… weird… that Rep. Lance “My wife has a communications contract with the Dunleavy administration” Pruitt lead off his questioning of Chief Procurement Officer Jason Soza during this week’s hearing on the privatization of the Alaska Psychiatric Institute with a reminder that Soza’s term is up soon. The state’s chief procurement officer serves for an appointed six years, and Soza’s term appears to be up some time in the next two months. He’s the administrator who ultimately approved the no-bid sole-source contract to privatize the facility, a decision that sure looked to be more and more flawed during the lengthy hearing where legislators poked hole after hole in the decision. Soza acknowledged that the administration hadn’t told him about Wellpath’s… rocky… legal history that includes more than 1,400 lawsuits and that he more or less deferred to the mountain of pressure from the administration, including Commissioner Crum and attorneys from the Attorney General’s office, that Wellpath was the only company capable of taking over. “The evidence presented to me described the awarded vendor as the only vendor capable of providing these services,” he said at one point, following a lengthy discussion about how Providence would have liked to competitively bid on the contract. Well, legislators are hoping that he makes up his mind soon. Reps. Ivy Spohnholz, Tiffany Zulkosky, Matt Claman, Jonathan Kreiss-Tomkins and Zack Fields penned a letter asking Soza to cancel the second phase—the one that gives Wellpath the five-year $44 million per year contract to privatize the facility—in light of the information about the lawsuits and the alternatives. Department of Public Safety Commissioner Amanda Price was in front of a skeptical House State Affairs Committee on Thursday, where she sparred with legislators over rumors about her work under the Walker administration (she says it was fine), her attitudes toward rural public safety and the Village Public Safety Officer (people just don’t appreciate her blunt, tell-it-like-it-is approach but believe her that she sincerely cares about improving rural public safety) or her lack of experience with law enforcement (law enforcement officers don’t make good managers anyways and she reports that she’s been told she’s the best commissioner ever by at least one employee). She also said that, yes, she was able to pass a background check. Public testimony was generally glowing, but Alaska Marijuana Control Board Chairman Mark Springer offered a different picture. He highlighted a litany of issues the agency’s enforcement officers have run into since Dunleavy and Price took over, noting that they haven’t got any material response from Price. The committee didn’t seem to buy much of it, and said they’d be holding at least one more session of public testimony on her appointment. The big point of contention appears to be whether or not her boss from the Walker administration, former Chief of Staff Scott Kendall, will get to talk about her time with the position. He wrote a letter saying that he would be prepared to testify, but only if she waived any possible obligations under the personnel act (though he acknowledges in his letter that because she was an exempt employee, it likely doesn’t apply). Rep. Zack Fields, D-Anchorage, asked if she would. “I don’t believe accepting an appointment requires me to waive any rights,” she said. The committee will be back for another round with Price next week. Bear control was front-and-center during this week’s Senate State Affairs hearing for appointees to the Alaska Police Standards Council, and senators were not happy to simply hear that improved trash cans and trash policies are the solution. We heard from a reliable source that Dunleavy’s Chief of Staff Tuckerman Babcock was in a car crash this week while visiting in the Kenai. The vehicle was reportedly totaled, but Babcock is OK.
Young shoves female reporter on way to Violence Against Women Act vote is a headline from this week. Really making Alaska proud. He did quickly and personally apologize about it, though. We were really interested to see whether or not a load of Outside money would have turned things around for conservative candidates in local elections. The answer, at least when it comes to GOPAC-funded candidates Kai Binkley Sims and David Nees, is no, no it does not. Progressives won in pretty much every winnable race on Tuesday’s election. The same couldn’t be said for the alcohol tax, which went down by a solid margin. 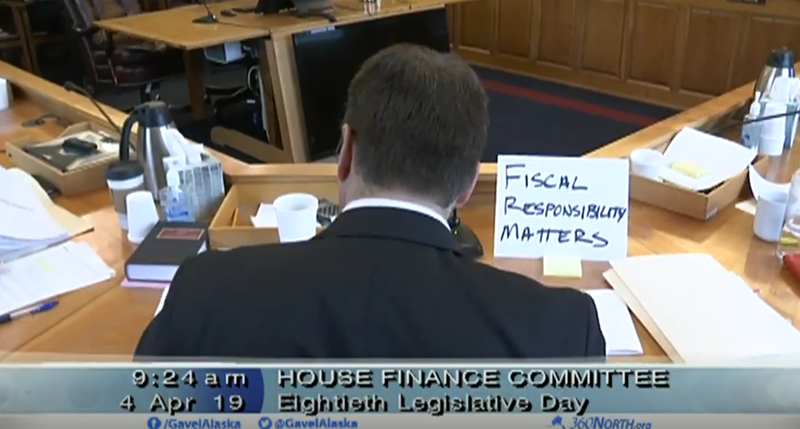 After initially balking at some of the impacts the governor’s budget would have on his community, Rep. Ben Carpenter, R-Nikiski, was all aboard the budget cut train this week as the House Finance Committee took amendments on the operating budget, making plenty of cuts but spiking some of the particularly bad ones. Carpenter seemed to lead the charge, offering diatribe after diatribe about fiscal responsibility and unleashing private enterprise all while extolling the vast benefits—and possibly even moral virtues—of drinking raw, unpasteurized milk. Of course one of the cuts made was eliminating the state’s dairy inspector, a move that will take Alaska-made milk off store shelves in a very open-for-business move. The committee also cut a $58 million chunk out of Medicaid, defunded the Ocean Ranger program, increase corrections spending, defunded shellfish inspections, eliminated school bond debt reimbursement and for good measure also voted to eliminate $334,700 in funding for abortions paid for through Medicaid services on a 9-2 vote. The last item will, like every other attempt to elimination abortion access for low-income Alaskans, be met with a legal challenge. All told, it sounds like the cuts come in somewhere in the range of $280 million to $300 million from the status quo budget. The Fairbanks North Star Borough is looking at a 1.6 mill property tax increase that’s growing in part thanks to the expected elimination of school bond debt reimbursement. Speaking of low-income Alaskans, the Senate rolled out its plan today to rework the dividend calculation to a 50-50 split of the percent of market value draw. It’s been coming since a hearing last week, where Sen. Natasha von Imhof said the move was in the works and the state needs to reconsider its priorities. 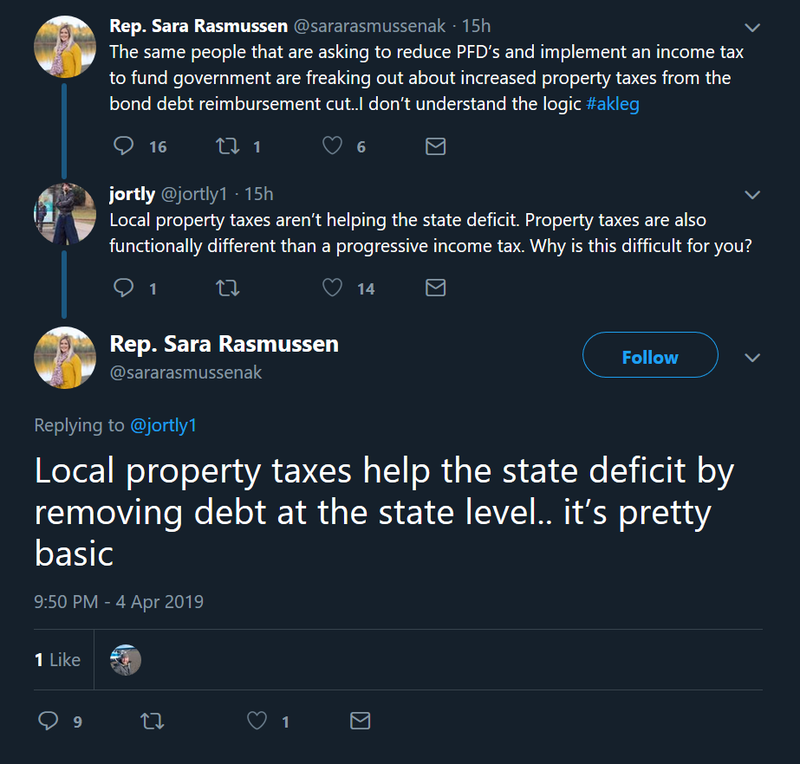 Of course, this comes just as we feel there’s some steam picking up on the idea of a broad-based tax as a better, more equitable treatment of all Alaskans in order to fund government. With a new house-district-by-house-district analysis out by Alaska Economic Trends that examines the median income of each district, budget commentator Brad Keithley crunched the numbers on how a flat tax would compare to reductions down to a $1,000 PFD. The legislation, however, is a little closer to a $2,300 PFD (requiring a $861 million cut to the budget). Mat-Su’s growth this decade will largely be at the expense of Anchorage and Fair-banks, in contrast to the 2000s. Mat-Su’s population on is now large enough for five full districts plus three-quarters of another and it has overtaken Fairbanks as the second-largest borough. This drops Fairbanks to five and one-fourth districts, which would be a return to its 2000 representation on level. The biggest loss is set to fall on Anchorage, whose population on now amounts to 16 districts, a decline of half a district from 2010. Anchorage still represents the largest number of districts by far of any borough or census area. The Alaska Democratic Party announced it’ll be ditching the caucus system for the 2020 presidential primary with ranked-choice voting with an option for electronic ballot submission. Neat. We look forward to the details. You’ve probably seen this beautiful collaboration between poet Christy NaMee Eriksen and videographer Ryan Cortes Perez, but watch it again. 2 Comments on "Friday in the Sun (April 5): The Fiscal Responsibility Matters edition"
If “….Businesses should be able to function with absolutely zero government support ….” then why do we give the oil companies $1.9 billion in tax credits? That’s government support.